Why Is My Arborvitae Turning Brown? Browning on arborvitae leaves can occur at various times of the year. When it happens in summer, the color change could be happening because of drought. But if your arborvitae shrub turns brown in winter or early spring, the likely reason is winter burn. The combination of wind, sun, freezing temperatures, and lack of available water in winter can cause arborvitae foliage (and the leaves of other evergreens, as well) to turn brown. This happens because they are drying out. Water is the lifeblood of foliage. When an evergreen shrub can't draw water up through its root system to its leaves during periods when the ground is frozen (at which time any moisture in the soil becomes unavailable), those leaves, already beset by challenging conditions, give up their green color. They have been killed by winter burn. 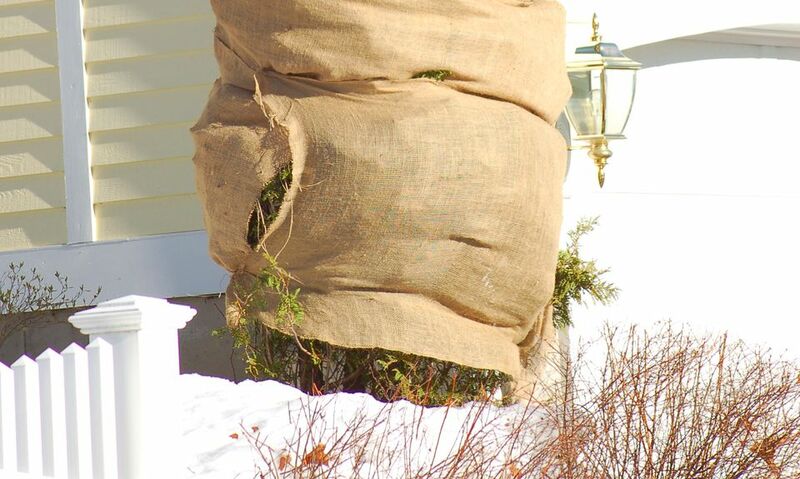 Regardless of the type of arborvitae you plant, your best bet for avoiding winter burn is to wrap the arborvitae in burlap. Placement in the landscape can also help prevent browning: Avoid planting arborvitae on the south side of a wall (the sun can be an enemy in winter) or in an area exposed to high winds. Ease up some on watering arborvitae in September to encourage hardening off, then maintain adequate irrigation from October until whenever the ground freezes in your area. Such an irrigation regimen will help prepare the shrubs for winter. Also look for opportunities to water your arborvitae shrub during the winter. You have probably heard the term, "January thaw," right? If the ground thaws out at some point in the winter (thaws can happen in February, too), take advantage. With the soil loose again thanks to the thaw, any water you spray on the ground can permeate down to the plant's root zone once again. This drink could help your shrub in the same way that a glass of water slakes the thirst of a wanderer in the desert. Another preventive measure is to apply garden mulch around your arborvitae. Winter burn is a moisture issue, and mulch helps conserve moisture in the soil around a plant. Arborvitae branches whose foliage turns brown (entirely) due to winter burn may not come back, but there is no sense in being hasty about pruning (you never know), so hold off on pruning until well into the spring or even summer. Only time will tell as to whether your arborvitae branches will recover from winter burn; there is not much you can do to reverse the damage that results in brown foliage. Instead, direct your efforts at preventing winter damage in the future. If green growth does, eventually, re-emerge on a branch damaged by winter burn, prune the branch back as far as that greenery. But if the arborvitae branch never shakes the "brown look," just prune if off entirely. Depending on how severe winters are in your region, you may also have to prune arborvitae because of snow damage.